Create great sculpted looks for your clients' top lips! 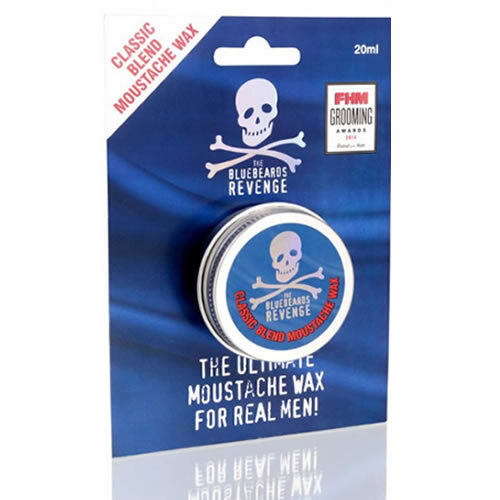 The Bluebeards Revenge Classic Blend Moustache Wax allows you to sculpt, shape and twist your clients' moustache to their desired style with ease. It offers strong hold and also conditions the moustache, but you won't need to use too much to get it working for you. It smells great (which is handy, as it's right under the client's nose!) as it's laced with the classic Bluebeards scent. Creates great slick styles and comes in a handy 20-ml tin. £4.43 (inc. VAT) Why no VAT? We're a trade wholesaler and quote our prices without VAT to help our VAT-registered customers understand the true cost of a purchase. Good quality budget shaving brush that's ideal for men returning to or starting with traditional shaving or as a 2nd brush to take when travelling. Nourishing post-shave balm with witch hazel and aloe vera to calm skin and Decelerine™, the active ingredient that, over time, should reduce beard growth. Comes in a 100-ml pot. Luxury shaving cream designed to combat tough stubble and made with Decelerine™ that actually reduces hair growth. Comes in a 100-ml pot that makes a great retail product for any barber's shop. Top notch shaving tool, precision engineered for a close, safe shave. Stainless steel head takes a double-edged razor blade and has been laser etched with The Bluebeards Revenge logo.